Net Asset Value (NAV) is the total value of assets net of the gross debt of the Holdings System as defined below. 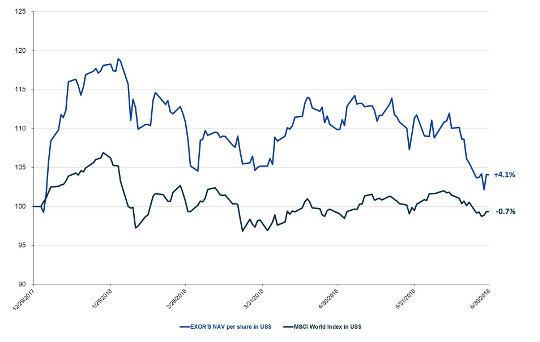 In determining the total value of assets at 30 June 2018, listed equity investments and other securities are valued at trading prices, unlisted equity investments are valued at fair value, determined annually by independent experts, and unlisted other investments (funds and similar instruments) are valued by reference to the most recent available fair value. Bonds held to maturity are valued at amortized cost. Treasury stock is valued at the official stock exchange price, except for the part designated to service stock option plans (measured at the option exercise price under the plan if this is less than the stock exchange price). The sum of the aforesaid values constitutes the total value of assets (Gross Asset Value). Gross Debt is the total amount of the financial debt of the Holdings System. At 30 June 2018 EXOR’s NAV is $23,909 million (€20,508 million), an increase of $937 million (+4.1%) compared to $22,972 million (€19,155 million) at 31 December 2017. NAV per share amounts to $99.20 equal to €85.09 ($95.32, equal to €79.48 at 31 December 2017). NAV is also presented with the aim of aiding financial analysts and investors in forming their own assessments. 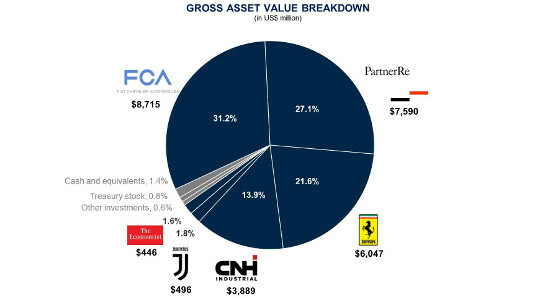 The following pie chart shows the composition of Gross Asset Value at 30 June 2018 ($27,966 million). “Other investments” include the investments in Welltec and GEDI in addition to minor sundry investments.